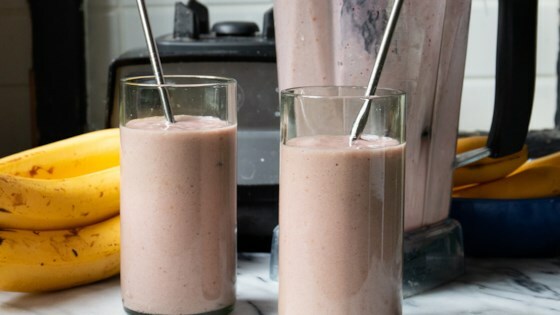 "Thick, and that sticky texture of figs, turn this smoothie into a yum-yum smoothie for those who like figs a lot or want to rid their fridge of this perishable fruit fast." Place the bananas, figs, milk, and orange juice into a blender. Cover, and puree until smooth. Pour into glasses to serve. Surprisingly delicious, considering I do not like to eat raw figs. This smoothie tastes like it has berries in it. I really like it, and highly recommend it. Thanks Sam! Fabulous! I used some very ripe bananas, unsweetened soy milk and high pulp orange juice, and it came out wonderfully thick and had just the right level of sweetness. This smoothie gets points for being quick, easy, nutritious, and delicious! My family really enjoyed it. I made it dairy-free by using almond milk (son has a sensitivity).